Blog established to inform a Digital Strategy for Scotland. Comments and contributions are welcome. What will the current fibre rollout achieve in Scotland? Revised 3/3/2014 following correction of a bug in the software used to the figures in an earlier version of this post. 4/3/2014 Changed threshold for superfast to >24 Mb/s (and recalculated figures) in response to comments. What will the current fibre roll-out achieve? This note (corrected 3/3/2014) is an attempt to quantify the impact of the Scottish Government’s Step Change programme on the availability of superfast broadband across Scotland. It is born out of frustration at the inadequacy of information in the public domain. Our main conclusion is that the claim that the current investment in Scotland’s infrastructure “will ensure that 95 per cent of premises in Scotland will have access to superfast broadband by the end of 2017-18” is not credible. We predict that at least 43% of the 450,000 households in rural Scotland will not receive superfast broadband from the current programme. There is no indication of how the 15% left behind following the core investment in Step Change will ever achieve next-generation speeds. These claims are made on the basis of the available data, and it is possible that we are wrong, but –- as scientists – we want to see the full evidence that refutes them. Will the Step Change programme achieve its target? Most people in Scotland are connected to a cabinet or an exchange by copper wire. If that copper connection is more than 1.3km long, it will not carry the > 24Mb/s required for the “Step Change” programme. The current plans are mostly to bring fibre to existing exchanges and cabinet locations. The data available to us suggests that around 84% of Scotland’s households are served from cabinets, and that less than 79% are connected to a cabinet by less than 1.2 km of copper. If every cabinet is upgraded, all of these homes should be able to order a superfast connection. For those on exchange-only lines, we can only estimate the copper lengths based on the distance to the exchange. On the positive side, we estimate that one third of the exchange only lines may be short enough to deliver superfast speeds. Our optimistic estimate is that up to 85% of households in Scotland might be able to access superfast speeds over their existing copper lines, if every exchange and every cabinet were converted. On the negative side, not all exchanges and cabinets will be converted, our speed estimates are based on the copper wiring being in good condition, and our estimates are conservative (they assume that the lengths of exchange-only lines are similar to those of lines that go via cabinets, but we believe that many will be longer). We therefore expect that the real situation will be much worse. For the final 16% – over a third of a million households – there is no upgrade path in sight: those on long copper lines will be left behind, not able to enjoy superfast speeds using the technologies currently being deployed. If we apply our analysis to the different geographies of Scotland, using the Scottish Government’s 8-fold Urban-Rural classification, the rural picture looks much worse. The table shows our optimistic estimates of the maximum reach of copper-based superfast in each of the eight urban-rural classifications, either via cabinets (FTTC) or by a combination of cabinets and exchange-only lines (FTTC+EO). These numbers do not take account of households receiving Virgin broadband via cable, but few, if any, of these are in the isolated postcodes far from an exchange. The heart of the Step Change programme is an extended fibre network. However being close to that network does not guarantee access to it. An analogy with a road system may be useful. Think of the fibre network – the information superhighway – as a motorway system. You can only get on to the motorway of you have access to an off-ramp; living next to the motorway is not enough. Similarly, fibre that just passes by is useless, unless there is a point of presence (PoP) nearby where local network traffic can join and exit the superhighway. In the last two years there have been a significant efforts by several communities to install their own networks (using wireless or local fibre) for fast broadband distribution. Such solutions to the problem of remote rural areas have recently been recognised by SG in its investment in community broadband, through Community Broadband Scotland. However, the funding available is limited, compared to the scale of the problem. Furthermore, such networks cannot realise their potential unless there is affordable access to a PoP. At present several hundreds of households are connected to local networks that could deliver superfast broadband, but there is no PoP for them to connect to. The fibre that will soon pass through remote and rural Scotland will have been subsided from the public purse, but it will belong to BT. Currently there are no published details of the locations of points of presence, nor of any contractual obligations on BT to provide access on competitive terms–and where there is public subsidy, there is no competition. The Scottish Government must ensure that communities, and third parties, can use this fibre to carry their traffic on transparent, fair and reasonable terms. The state aid approval for the BDUK programme requires BDUK to publish details of “the wholesale products on offer and the pricing of those products.” However, the information published to date, is entirely inadequate. There are no details of points of presence, not even their positions, nor of the products that will be offered, nor their pricing. In 2001 the Scottish Government published a report correctly identifying the need for rural Internet and suggesting a good strategy for delivering it. At present Scotland has no plans that will achieve the EU target of 30 Mb/s to all by 2020. It has no plans for delivering it to the final 15% of its population, which includes almost half of its rural households. Rather than assuming that a virtual monopoly of the telecommunications infrastructure will solve the problem if given enough money, the Scottish Government needs to act quickly, decisively and independently in order to avert the likelihood that yet another generation of rural inhabitants will miss out on the opportunities for social, political, and economic development afforded by the Internet. Without regulated open access to the publicly subsidised core infrastructure, sufficient to enable communities and third-parties to develop and maintain alternatives to the too-long copper connections – alternatives that must support both domestic and business connections – we see no way forward for those left behind by Step Change. There was a bug in the programme used to calculate the figures given an earlier version of this note. The situation in urban areas is significantly better than we had said; the rural situation marginally worse. Line-length data, courtesy of GreySky consulting, locations of BT exchanges, and census data. We have also published interactive maps giving more details of our results . In an article, Mobile internet use grows in Scotland, published on August 1, 2013, Ofcom claim that Consumers in Scotland experience the same frequency of problems as those in the rest of the UK. Q.13 Thinking about your mobile reception with ... in the UK, do you ever experience any of the following issues? It is good to see that the data tables now include median speeds by postcode (more on these in a later post), and that a graph showing modem sync speeds is also published. This post looks at the graph. 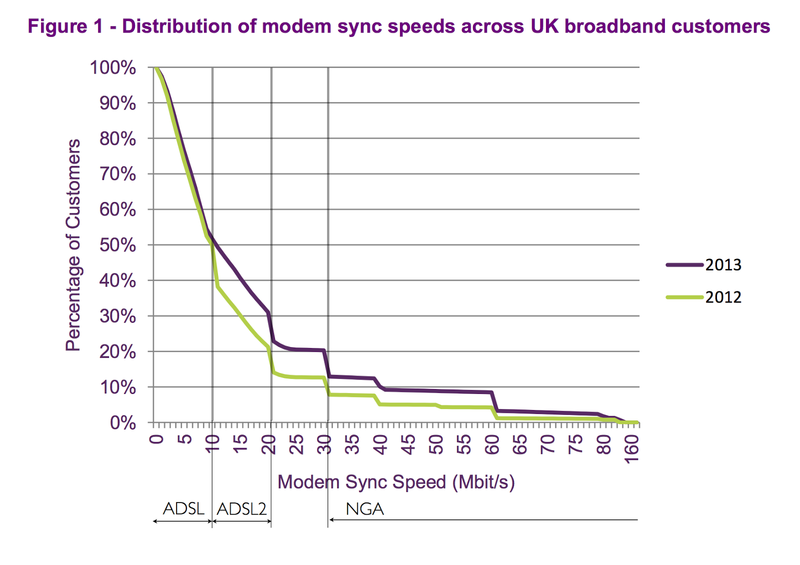 Figure 1 shows the Distribution of modem sync speeds across UK broadband customers. Here is an annotated version. The graph clearly shows three distinct technologies: ADSL, ADSL2, and next generation access (NGA – which includes both BT's VDSL and Virgin's cable). The jump from ADSL or ADSL2 to NGA is indeed a step change. On the face of it these figures show improvement across the board. But the graph tells a more subtle story. In 2012, maybe 12% of those getting ADSL speeds were getting the maximum possible from that technology. The remainder – say 49% of the population – were getting lower speeds, presumably because their copper lines were too long to go any faster. 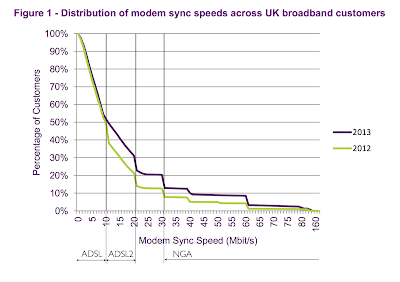 By 2013 those whose lines were short enough to get the maximum speed from ADSL had moved to ADSL2 or NGA. However, if we are to believe this figure, ver few of those with ADSL connections running slow on too-long copper in 2012 saw any improvement at all. The mean speeds reported with much fanfare have increased, because the digital-rich, whose connections already ran faster than most in 2012, just got richer. But the median speed is almost unchanged, since few of the digital poor – those whose connections ran slower than most in 2012 – have seen any significant change. The digital divide is widening. 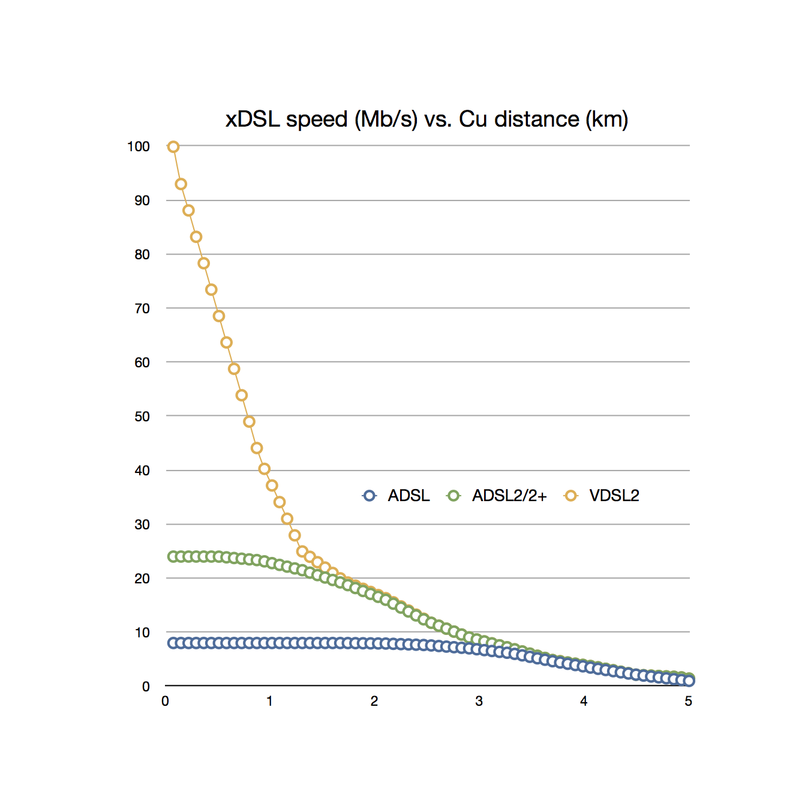 The line for 2013 shows that some of those now on ADSL2 technology have copper lines short enough to get its maximum speed – but that many do not. The fibre-to-the-copper (FTTC) technology, being used for the BT/BDUK broadband programme, uses VDSL over the copper line to the home, and any copper too long to deliver ADSL2 at maximum speed will not do any better with VDSL. Instead, part of the copper line is replaced by fibre to the cabinet, and unless your line from the cabinet is shorter than about 1200 metres you will not see any useful benefits from NGA. As yet, it appears that virtually none of the digital poor have benefitted from FTTC. How close is the fibre to you? If your broadband connection is delivered down your copper 'phone line, your speed is fundamentally limited by the length of the line to the exchange (or where BT has rolled out FTTC, to the cabinet). Exact performance depends on many factors, but there is a fundamental inverse square law, and typical limits are of the order of 300m for 100Mb/s, 1km for 10Mb/s, 3km for 1Mb/s. Some 85% of homes in the UK have more than 800 neighbours within 700 metres. We build maps that highlight such compact communities that are far from fibre. For example, most of Porthleven is more than 3km from the nearest exchange, as are substantial parts of East Kilbride, Nitshill and Hartlepool (these links should open in a new tab). Google maps will only show a small number of hotspots at a time – and there are thousands of them. To explore your area, you can examine our hotspot maps on Google Earth, which can cope with large data sets. Clicking on the link should download a .kml file that can be opened in Google Earth. In Chrome, you can instruct the browser to "Always Open Files of this Type", or just open this one. For more detailed instructions see below. The hotspots on these maps are likely to be not-spots. Hopefully many of these areas will be served by FTTC, and we'll be happy to update the maps if someone can provide positions of FTTC cabinets - or any other NGA provision. phone line - and for 100Mb/s speeds your copper ration is < 400m. You can see what BT's 'Superfast' Broadband plans are (as of April 2012) by clicking on the pin representing each exchange. If you live in a less-densely populated community (with fewer than 800 neighbours within 700 metres) then you might want to plan a community network to bring NGA to your homes and you should be asking where you can access affordable fibre backhaul nearby. Our distance computations were based on Sam Knows data, from which some exchanges are missing - so in a few instances you may find an exchange marked inside a 'hotspot'. The Open Reach data does not always plot the exchanges accurately. Some are a few hundred metres from their true positions. The Sam Knows data has similar (but different) errors. Because there is no publicly available dataset of cabinets, we cannot plot your distance from the cabinet. Likewise, we have no data on the Virgin network. You may be getting superfast access from within one of our hotspots – in which case lucky you! Do let us know, in the comments below. When you import the .kml file into Google Earth, you should see a new entry appear in the GE sidebar. Zoom in to your area of interest. Once you zoom in far enough your local exchanges should appear. Click on the 'pushpin' to see BT's plans for SFBB at this exchange. Click on the triangle to open the 'Digital Britain?' folder. 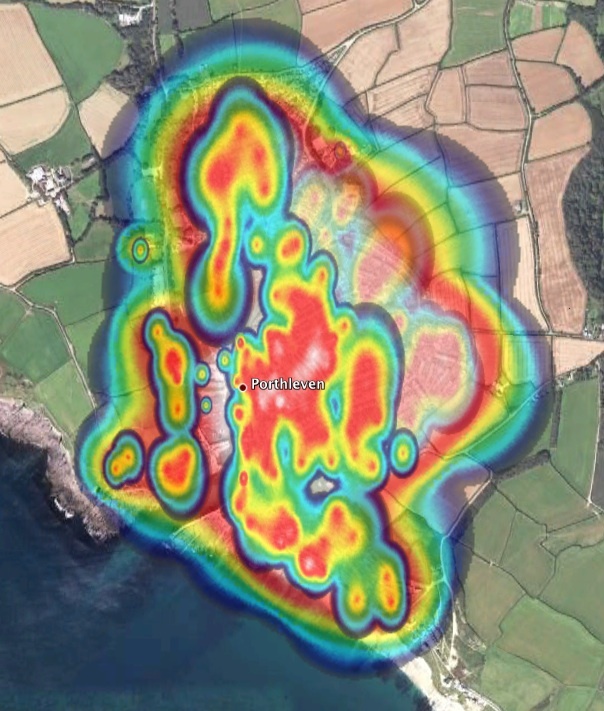 Open the 'Compact Communities' folder to see, and select, the various heatmaps available. Is the UK on track for 2015? Current data suggests that this investment in fibre is not yet being made. Click title link for detail. We hope that our interim and final reports may have contributed to the UK government's rethinking of its broadband strategy since July. Today's Britain's Digital Future announcement from the UK government echoes several of our recommendations, including the key recommendation that, Every community will get a digital hub so that by 2015 the UK has the best fast-broadband network in Europe.. In a dot.Rory blogpost published today, Rory Clelland-Jones (@BBCRoryCJ) asks what this means. What is a digital hub? What is meant by every community? The answers will be crucial to the success of the policy. Our final report has detailed answers to both questions. What is a digital hub? First, a hub should bring a fibre connection to each community, so that community networks and service providers can access a trunk connection to the global internet. To stimulate innovation and maximise opportunities for revenue generation, wholesale access should be open at several levels, including IP services, leased wavelengths, dark fibre, ducts and poles. At the IP level, Britain needs regulation that provides existing and new providers with a level playing field guaranteeing access to equitable peering and transit contracts. Britain's core digital connectivity should enable appropriate use of all technology options: cabled and wireless connections, dedicated and over-IP channels, symmetric interactions, and real-time and on-demand content delivery. A hub providing every community with open wholesale access to fibre should enable domestic, business and wireless providers to develop innovative forms of local access. Second, social hubs should be provided so that internet access and support is available to residents and visitors, in libraries or other community centres. What is meant by every community? To enable universal access to next-generation speeds, the core backhaul infrastructure, must bring fibre within reach of every community of 2,000 people. Wherever a circle drawn on the map encompasses a population of at least 2,000 people, that circle should include a hub. Martha Lane Fox, the UK's digital champion, attended the industry day on 15th July at which Jeremy Hunt abandoned the 2 Mb/s target for 2013. She said it was essential that Britain achieved universal broadband coverage at 2Mbps as soon as possible. "I know fibre rollout is important, but I personally think we can do a lot by hitting the universal service commitment," she said. In Scotland, our analysis shows that even to deliver 2 Mb/s will require the rollout of more fibre infrastructure. In fact, our analysis suggests that to deliver any significant improvement on the status quo, for communities outwith the major conurbations, will require a coordinated national strategy. To deliver 16 Mb/s internet access to Scotland’s population will require concerted and coordinated infrastructure planning, and sustained commitment. Here we only presume to identify the key infrastructure that must be developed, and to outline the kind of planning that is required. At a local level, the population densities at which most of Scotland’s population live are comparable with those in England. Indeed, for 90% of the population they are higher. We conclude from this that Scotland can exploit the same “last mile” technologies as the remainder of the UK. The un-forested scottish countryside may facilitate more use of wireless for backhaul and access distribution. A prerequisite for local provision of an access network is the availability of a “backhaul” internet connection. Wireless and copper connections can only provide limited bandwidth. For our calculations, we use an optimistic figure of 512 Mb/s for the maximum backhaul that can be delivered by copper and wireless technologies. The total bandwidth required to serve a community is the product of the subscriber bandwidth and the number of subscribers, divided by the contention ratio. So a simple calculation allows us to quantify the subscriber bandwidth delivered by a given backhaul capacity. Backhaul for current consumer connections is typically provisioned at a contention ratio of 50:1. As households include more connected devices, and as the use of streaming media and distributed interactive applications (such as cloud-based services, multi-player games, and video chat) increases, we believe that assuming 50:1 contention will be unrealistic. We use a figure of 25:1 to estimate the backhaul required to connect a community to the internet. For these estimates we do not add a separate allowance for business connections. The main distinguishing feature of business connections is currently that they require more symmetric connections. This will affect the design of local access networks, but is not relevant to the issue of fibre backhaul provision. For our purposes, we assume that the population will make similar demands on backhaul whether working at work, working from home, or just using the internet for everyday life. We assume an average household size of 2.5 people. A 512 Mb/s connection can support a 512 Mb/s service for 25 subscribers, or a 256 Mb/s service to 50 subscribers (population 125) at a 25:1 contention ratio. 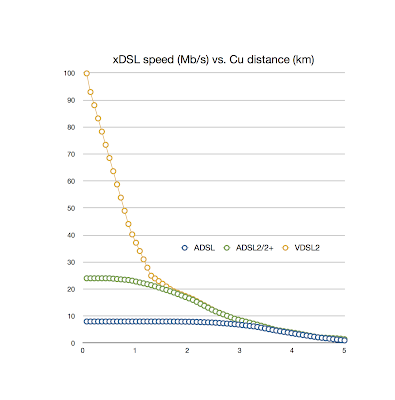 Working backwards from a required subscriber bandwidth, we can compute the maximum population that can be served by a wireless or copper backhaul connection. Larger populations require multiple connections; wherever these are aggregated, there must be access to fibre. How much backhaul do we need? If we want to get beyond the 2 Mb/s barrier we have to bring a fibre point of presence to every 16,000 people, and to get to next-generation speeds beyond 16 Mb/s will require a fibre connection to every population of 2,000. To do less would be short-sighted. The accompanying map (2.4 MB pdf) shows the minimum spanning tree of Scotland's census output areas coloured to show, in green roughly where there is documented existing fibre, in red the new rural fibre that would be needed to bring fibre to each community of 2,000, and in blue the distal parts of the network, the local access networks that will use a mixture of wireless, existing copper, and fibre to the home. RSE calls for Scotland to take urgent and innovative action on broadband. “Communication is the life blood of society. Scotland’s future depends on having in place an effective digital infrastructure that will underpin a successful economy, vibrant culture and strong communities” explains Professor Michael Fourman, chair of the report ‘Digital Scotland’ that will be published by the Royal Society of Edinburgh on Tuesday 26 November. Digital Scotland sets out a comprehensive plan for the creation of a core fibre infrastructure that would bring high speed broadband within reach of all of Scotland’s communities: urban, sub-urban and rural. It calculates the capital cost required to ensure that all of Scotland can keep up with the global pace of development over the next few decades at around £100 million. For reasons of social inclusion and equality of opportunity, Scotland cannot afford a widening digital divide. The report proposes that this enterprise could develop as a distinctively Scottish community effort, bringing benefit to the whole of Scotland, with innovative funding options that need not call on the public purse. The working group recommends that a Digital Scotland Trust be established to raise finance, procure, operate and maintain the core digital infrastructure in the national interest. It calls for an optic fibre backbone, akin to the trunk roads of our transport network, to be created, that will bring next-generation speeds to a nationwide network of digital hubs from which community networks and service providers can connect to the global internet. And it recognises the need for social hubs, where internet access is available to all, in libraries and other community centres, and where support is available to groups who would otherwise be excluded from digital society. Broadband communication offers dramatic increases in economic efficiency through reduction of transaction costs, and the opening of access to global markets. These come hand in hand with advances in data collection and analysis, improved user engagement provides real time customer feedback. Improved decision making reduces the reaction times of businesses in responding to threats and opportunities, claims the report. And it’s not just about business. The social benefits are enormous – enhanced broadband capacity increases social interaction in communities, opening up more opportunities and greater flexibility at work and in leisure. Both consumers and producers benefit from a more efficient economy. More people have the opportunity to contribute to the workforce. Rural areas excluded from the modern economy can now engage. Parents staying at home to raise children can work flexibly from home. The web has revolutionised social interactions amongst the young in particular. Social networking sites, pervasive communication and ready access to information and knowledge through instant search are not an integral part of the social structure of modern life. In the USA for example 17% of couples married in the past 3 years first met on an online dating site. Information technology is also providing a powerful stimulus to the strengthening of civil society, in which many hopes were invested at the time of parliamentary devolution. Digital systems have the capacity to enhance the delivery of public services at a reduced cost in health, education, social services and other areas of government responsibility. Lack of infrastructure capacity limits the provision of local access, the delivery of next-generation speeds to homes and businesses, and the rollout of mobile data services. The Digital Scotland group welcomes BT’s work to extend its fibre to more exchanges; and the announcement on 20 October that the Highlands and Islands have been successful in securing one of BDUK’s three rural broadband pilot projects which will be delivered in conjunction with the BBC. The important point is to ensure that this delivers open access to affordable backhaul at fibre speeds. These initiatives will reduce the scope and lower the cost of the programme required. The report is already receiving widespread support. "the issue of the lack of trunk capacity is a real constraint on the promotion of economic development in island and remote rural areas, .... island and remoter links are not robust"
Scotland has a broadband strategy – dating from 2001. In this post we look to see what has changed over the past decade. Short synopsis: nothing has changed but the numbers. The 2001 strategy considered the backhaul requirements for five small towns. The speeds from 2000 look quaint (but remember, that even today the 26,000 population of the Western Isles shares one 34 Mb/s connection to the internet). To adapt one of the key findings of the Digital Scotland working group to the language of the 2001 strategy, our Digital Scotland report finds that every 1,000 people require a backhaul bandwith of 32 Mb/s (at 25:1 contention, for 400 subscribers) to achieve subscriber speeds of 2 Mb/s – we argue that this is the minimum speed required for "functional internet access" in 2010. By 2015, median speeds will have increased eight-fold. The minimum speed, available to all, should rise similarly, to 16 Mb/s, at which point a community of 1,000 will require 256 Mb/s of bandwidth. We should plan beyond that, for universal speeds of 128Mb/s in 2020. Taking the 2000 populations, for ease of comparison, We see that each of these towns will require gigabit backhaul before 2015. This requires fibre. This why we recommend that every community of 2,000 people should have access to a fibre backhaul connection by 2015. Only fibre can provide the bandwidth required, just to satisfy the private demand. The good thing is that once fibre reaches a community the backhaul issue will be resolved for decades to come. A single fibre can carry over 100 channels using different colours of light, and each channel can carry 100 Gb/s. Installing surplus fibre is cheap, so we can invest for the future as we provide for the present. We must act now. Already many parts of Scotland cannot improve their internet connectivity for want of backhaul, and providers cannot extend mobile broadband coverage to many parts of Scotland for the same reason. ensure that every school has access to a rich online world in which it will be possible to communicate with others by text, voice or video. ensure that all parts of the health service can transfer data and use telemedicine as necessary. ensure that all local authorities can provide modern, customer focused services. Our objective is that, by providing broadband to the public sector, we stimulate providers to offer a wider range of services to business and individuals. Higher bandwidth facilitates high volume data transfer and certain applications, such as video-streaming and concurrent design. If we are to have world-class education, world- class health services and globally competitive business, it will be vital that the latest applications can be used and for this we need “always on” broadband. To be world-class, we need to be at the leading edge in the use of ICTs. That will require action to promote use, supplementing the stimulus of competition and the market. Demand is important, but the market does not always respond quickly enough. Therefore the focus of this paper is how we ensure that when demand exists, services can be supplied. In short, we need a world-class broadband telecommunications infrastructure. We still find it difficult to plan because, "None of the maps of telecoms trunk and local networks in Scotland are either comprehensive or definitive. This is because firstly, this information is very largely commercial-in-confidence and secondly, the network is constantly evolving." We still find that the issue of the lack of trunk capacity is a real constraint on the promotion of economic development in island and remote rural areas, and that island and remoter links are not robust. It is still the case that Monopoly provision persists in rural and remote areas. The 2001 concern about whether it will achieve future widespread commercial provision of broadband services to meet anticipated demand, has given way to certainty that it will not. The key challenge remains: how to build on existing network strengths whilst addressing the shortcomings of the existing infrastructure, particularly in rural areas. Scotland was an early leader in broadband access, with a programme targeting universal access to 512 kb/s broadband completed in 2009. This was largely successful. In practice, however, some consumers only achieved somewhat lower speeds, and over 2000 have only satellite services, with latencies of around one second making them unsuitable for many interactive applications. More important, the infrastructures established to deliver these services will not scale to keep pace with the growth of broadband speeds worldwide. The importance of competitive data communications has long been recognised by the european universal service obligation (USO). The connection provided shall be capable of supporting voice, facsimile and data communications at data rates that are sufficient to permit functional Internet access, taking into account prevailing technologies used by the majority of subscribers and technological feasibility. Median broadband speeds in the UK are already (in 2010) over 5 Mb/s. As the usage of broadband interaction increases, median speeds will follow Nielsen’s Law, which predicts continued growth over the next decade, by a factor of 8 every 5 years. So we anticipate median speeds in the UK of 40 Mb/s in 2015 and 320 Mb/s in 2020. These targets should be subject to rolling review. The current Ofcom USO dates from 2005 and cites a figure of 28.8 kb/s. Just updating this by applying Neilsen’s Law would give a figure of 256 kb/s in 2010 and 2 Mb/s in 2015 (which matches the latest Westminster government policy). We recommend that this should be reviewed to take into account prevailing technologies, with a universal service obligation to provide access to the internet at speeds that are not less than one quarter of the median speed delivered to UK subscribers. These are targets for minimum download speeds for universal access. We expect median speeds to be 2-4 times as fast. In our next post we analyse the infrastructure implications of these targets. Download speed is not everything – low latency and upload speeds are also important. However, we will find that the infrastructure required to achieve these download speed targets will also support low latencies and symmetric services. Our aspirations should be compared with those of our international competitors. For example, Finland has a commitment to deliver 100 Mb/s to all by 2015. This places Finland five years ahead of broadband rollout curve. However, current Westminster policy is to lag a further five years behind even our more modest goal.